As a makeup artist and beauty junky, I’m constantly asked what my favorite makeup products are. The beauty and the beast (pun intended, March 17th – I can’t wait!) of the beauty world, is that trends are constantly changing! Brands and makeup collections are one season ahead of you and once you start LOVING your new Becca Champagne Pop, you quickly discover Glossier Haloscope is now all the rage. Figuring out if you should spend the money on the “latest and greatest” products that come out can be challenging. We’ve all been there, I know, but it’s time to figure out where you want to save and splurge on when it comes to makeup. For me personally, I have a few key drugstore favorites, but I’m also a VIB Rouge (#guilty) and love brands like Hourglass and NARS. Wait for beauty events – Nordstrom Trend Shows, various brands have dedicated events throughout the year, or simply make friends with your favorite makeup girl at your local Nordstrom and have them let you know when events/gifts with purchase are coming up! Try it before you buy it – Sephora employees are some of the best customer service oriented people I’ve ever had the pleasure of working with. They are constantly offering to make samples if you are looking to try something before you buy it. Join a beauty loyalty program – Sephora’s Beauty Insider program is one of the best! I’ve discovered so many brands from the free gifts they occasionally offer and not to mention, the deluxe samples I’ve received through earning rewards are always the perfect way to find new products for your makeup bag. Now back to the exciting part! I’ve rounded up my favorite “save” and “splurge” beauty buys, so regardless of what your wallet situation is, there’s a product (or two) for you. What are your favorite beauty buys? Make sure to leave them in the comments! Happy March! One of the many reasons I enjoy having this blog is the opportunity I get to share some of my favorite experiences and more importantly products with you! Although most people know what strobing is, many don’t know how to achieve it. I’m constantly being asked by my clients how to get that “glow” from within look, without looking…..sweaty. Below, I’ve not only picked out the best of highlighting game, but have also shared some tips I’ve learned along the way to get that perfect highlighted look. The key here is to make sure you’ve chosen a highlighter that complements your skin tone for a subtle sheen. Long story short, we’re trying to avoid the 90’s frosted look. As you see above, the Anastasia Glow Kit (available in two different color combinations), has a variety of different shades that you can layer on top of one another or on their own. These options allow you to find the perfect highlighting shade for your skin tone. My personal favorite right now is the Becca x Jaclyn Hill Shimmering Skin Perfector in Champagne Pop. The color pay off is amazing and I’ve found that the shade itself is very universal and more importantly flattering. Now for the placement, my rule of thumb is always to highlight the highest parts of your face (or spots that catch light) such as your cheekbones, down the bridge of your nose, below your brow bone, in the corners of your eyes, and above your cupid’s bow. 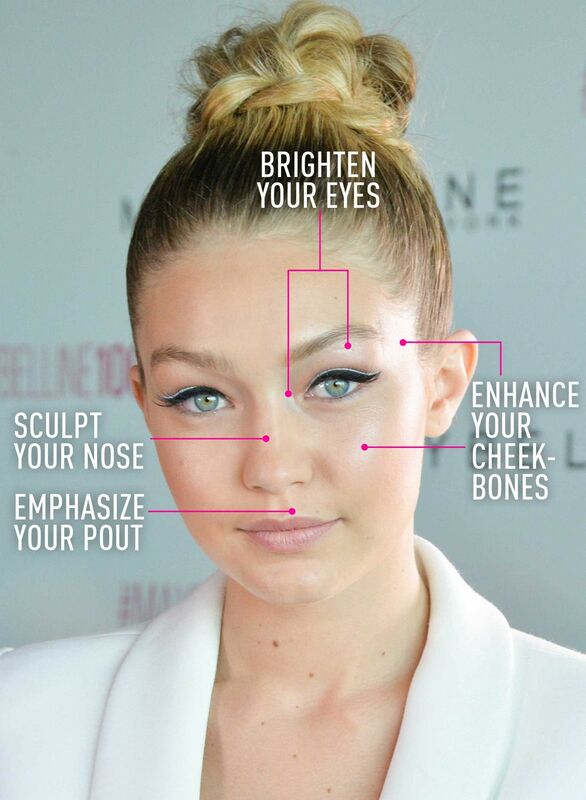 You can also refer to this Cosmo image + the flawless Gigi Hadid on the best areas to highlight. To avoid looking overly shiny when using a highlighter, stick to matte bronzers and blushes for this particular look. Lastly, make sure you blend any harsh edges of highlighter so it fades into the rest of your skin. Brush recommendations: Sigma, Bobbi Brown, Charlotte Tilbury. Do you have any highlighters you can’t live without? Share in the comments section! Happy Wednesday! Can you believe we’re more than half way through February? I’m not mad about it considering we’re one month closer to warmer weather and summertime in Chicago! Anyway, let’s get to today’s post shall we? Remember a while back when I raved about my hair experience with George the Salon in the Gold Coast? I’m SO excited to announce that they just unveiled their very own, Signature Citrus Crushed Pearl Massage and it is nothing short of AMAZING. This luxurious massage features crushed freshwater pearls and blends of lime, mandarin and lemon oils. The massage treatment is led by seasoned massage therapist, Maggie Klasa, who has 15 years of experience under her belt. Maggie made me feel comfortable and more importantly, relaxed throughout the entire message. I really appreciated that she made sure to check in with me at various points throughout the massage to see if the pressure was to my liking. Let me walk you through the massage experience from start to finish. PS. I don’t blame you if you stop halfway through the post to call and book your own massage with Maggie. 1. To begin, Maggie used fresh infused essential oils and a lime blossom body scrub to exfoliate my skin. This speeds up the skin renewal process, which allows new healthy skin cells to regenerate. 2. Soft, hot towels and compressions were then applied. This was a perfect addition to my massage as Chicago hasn’t seen a warm day since October. 4. Maggie continued with a deep massage of a citrus fresh essential oil blend of orange, tangerine, mandarin, and grapefruit. 5. Finally (my favorite part), the luxurious crushed pearl body cream is applied to the back, hands and feet. I’m not kidding when I say, this cream smelled absolutely AMAZING, I wanted to lather my entire body in it (oh wait she did)! The crushed pearl cream is formulated with nourishing oils and crushed freshwater pearls and I want my own personal bottle for daily use! How beautiful is the artwork inside the waiting area?